Fuji is Japan’s most iconic mountain, and has been listed as a World Heritage site. We organize a climbing party each summer, but the mountain is just as beautiful to look at, and some would say more beautiful when observed from a distance, instead of under your boots. Most people actually. Especially sane people. Due to altitude, it can be very cold at this time of year, especially in the cave and the forest with some snow still on the ground wherever there is shade, so please bring warm clothing that you can put on when outside our vehicles. The weather around the mountain can also change quite suddenly, so please bring wet weather gear, umbrella etc. We begin this tour with a visit to Miho Matsubara. A long sandy beach, that due to strong prevailing winds is now lined with fantastically twisted pine trees. 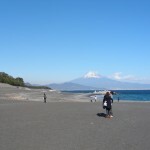 It is famous for it’s views of Mount Fuji across Suruga Bay, and the legend of Hagoromo. 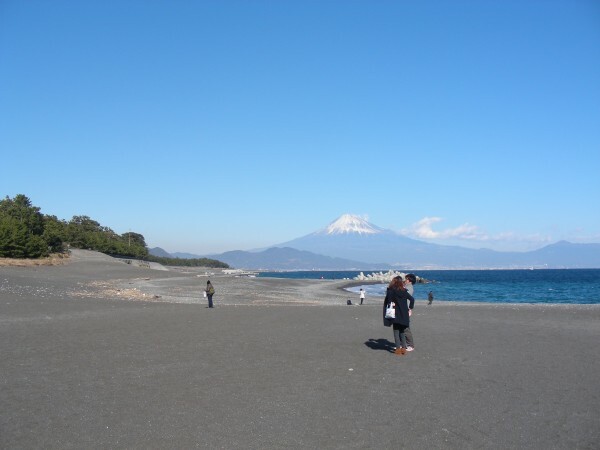 These days the famous white sands are now a combination of pebble and volcanic black sands, but the views across the water of Japan’s highest mountain are unchanged (weather permitting). Mount Fuji, when it chooses to be visible, is always snow capped at this time of year. Known as one of New Three Views of Japan (Shin Nihon Sankei), the legend revolves around a 650 year old pine tree called Hagoromo no Matsu, where it is said an angel wearing a Hagoromo visited, bathed naked, and after a local fisherman took her clothing, negotiated the return of her clothing by dancing (after which she returned to the heavens). 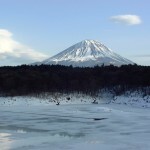 It is spring, but due to snow cover and ice, we won’t be visiting the 5th station of the road up Mount Fuji. Instead we will skirt the mountain on the western side, where hopefully we will get some good views of the peak. As we head inland, we enter the area of the Aokigahara forest. It is famous for being exceptionally quiet and eerie due to having little wind and relatively little wildlife, and infamously for suicides unfortunately. You can rarely hear any birds. The forest is honeycombed with caves and lava tubes, many of which were used for ice-making and sericulture (silk worms) until well into the 20th century. One of our main destinations here is the Saiko Bat Cave. This is the largest lave tube in the area, located deep in the forest. It is home to many bats, but also has many interesting stalactites and lava domes. Helmets are provided, but for safety you also need to bring walking shoes or hiking boots (leave your heels at home today). On the main route through the cave, the clearances are often less than 90 centimeters high, and moving through the cave becomes very difficult if you are very tall, or unwilling to get your hands (and knees) dirty. While the helmet will protect your head, a small towel is useful for stopping dripping water from falling onto your neck every time you try to duck underneath another low clearance. There is however an alternative route through, so pretty much anyone who can walk can explore most of the publicly accessible parts of the lava tube. There is some illumination inside the cave, but bringing a small flashlight is useful. We will also visit 2 of the famous Fuji Five Lakes, Saiko and Shojiko. These are the smaller and less touristy of the lakes, with Shojiko created when lava flows from the volcano separated an older lake into several sections during an ancient and massive eruption. The other lakes tend to be surrounded by tacky, poorly designed buildings. 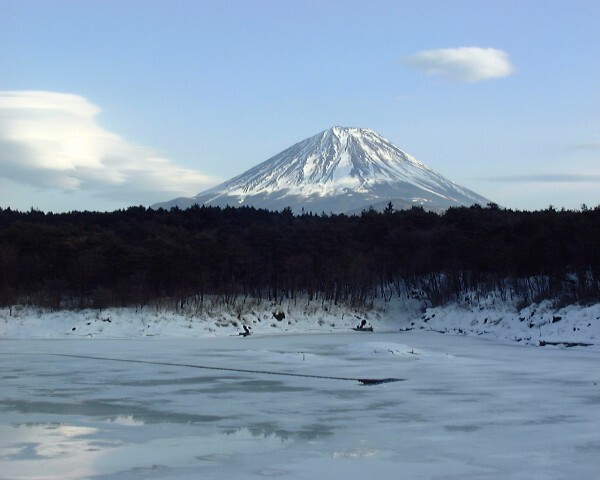 During the winter the lake freezes over and you can walk on the ice, which is part of our Discovery Program, but in any season the views of Fuji from here are fantastic and immensely popular with photographers. Bring or borrow a tripod if you are of the photographing persuasion. Next destination is Iyashi-no-sato Nenba. The small village of Nemba was noted for “Kabuto-zukuri” thatched roof houses. Kabuto-zukuri means that the roof (is said) to resemble a samurai warrior’s helmet. You need an active imagination, but the rooflines are beautiful and the constructions authentic. A major typhoon in 1966 caused extensive damage, which is part of the reason why the houses of Nemba are not as well known as the “Gassho-zukuri” thatch roof houses of Shirakawa-go in Gifu, but when Fuji is visible in the background, it is a photographer’s dream. It is also a great place for souvenir hunting, especially if you are interested in traditional handcrafted goods. At the end of the day, we visit Shiraito-no-taki. The heavy rainfall and snow melt of Fuji produces many cascades and waterfalls. Shiraito-no-taki means “waterfall of white threads”, and it is beautiful. The water cascades through hundreds of holes in the porous volcanic rocks of a cliff, producing a waterfall over 150 meters wide, and is especially beautiful in spring. The waterfalls are part of the National Park protecting many of the local sights in the Fuji area, and recent investments have improved the infrastructure in the area, removing some unsightly souvenir shops that were too closely located to the falls, and also opening up some free space which (if you are lucky with the cloud cover) offer good views of Mount Fuji. Depending on the temperatures in spring, this is good place to get a photo of Fuji with flowering cherry blossoms in the foreground.